Today I received the best possible cruise news there is. 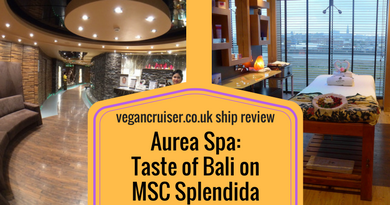 If you have read my three posts on cruising vegan on the brand new Carnival Horizon (see here) you too may have gotten rather excited & wanted to sail her. Or just generally give Carnival Cruises a go. Unfortunately, for those of us who reside in Europe, Carnival doesn’t have any ships on our shores anymore. The next new Carnival ship, Carnival Panorama, enters service at the end of 2019. While she is being built in Europe, she won’t be sailing here at all. After my excellent Mediterranean Carnival cruise this year I have been trying to figure out how to fund a long flight over to Florida e to have more Carnival cruise fun. 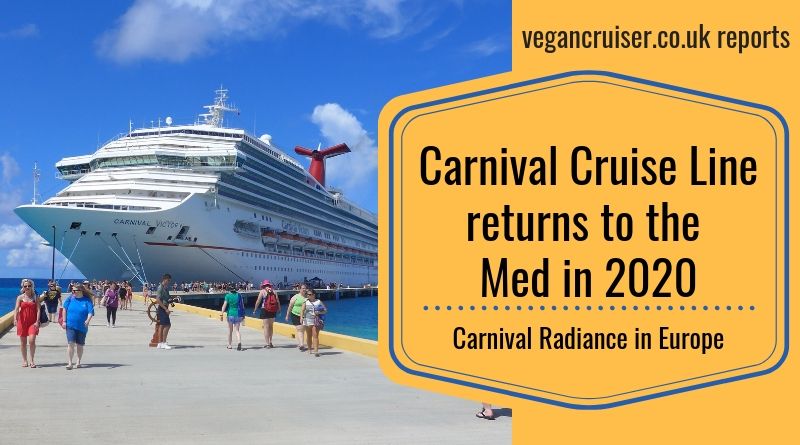 Now it looks like I won’t need to… Carnival Radiance will be in Europe, sailing on the Mediterranean in 2020! Why am I so excited? After all, most European cruisers don’t really know Carnival but they ought to – especially those who are young and/or fun-seeking kind. 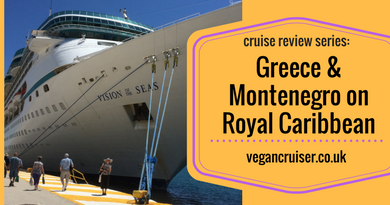 I have had two excellent cruises on Carnival and am now looking forward to my third – on the ship that was my first Carnival experience. How’s that going to work? Isn’t Radiance a new ship too? Let me explain…it will all make sense shortly. 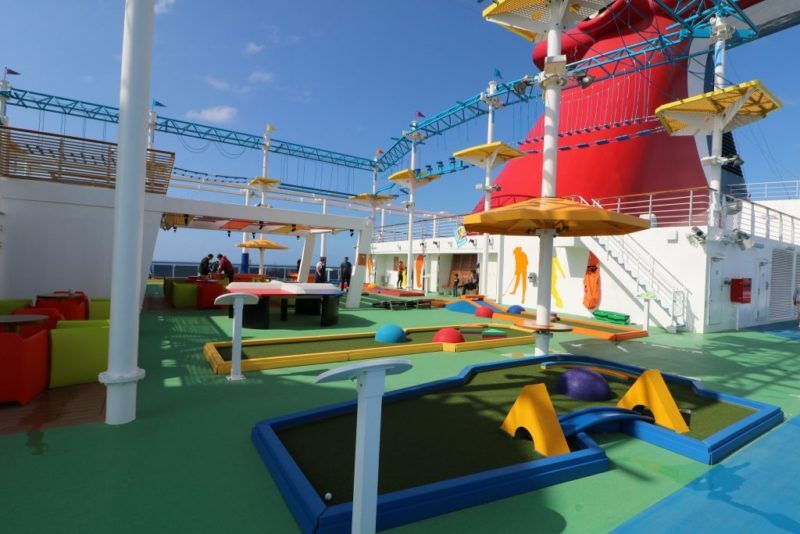 Carnival Radiance isn’t a brand new ship to the fleet. 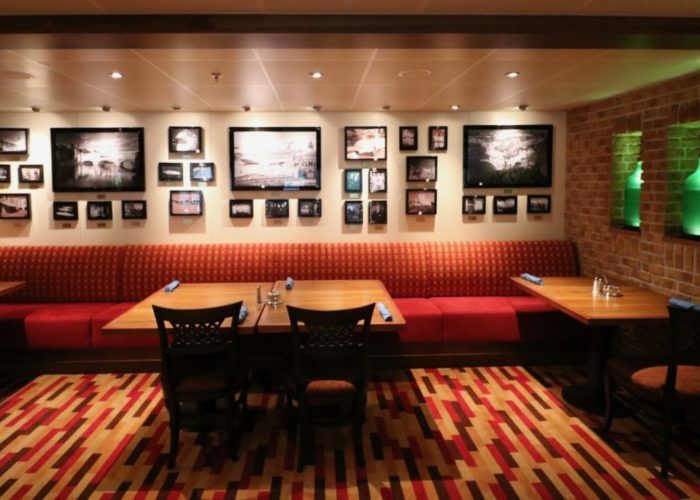 She is what the current Carnival Victory will be called once her extensive $200 million dollar refurbishment is completed at the end of April 2020. 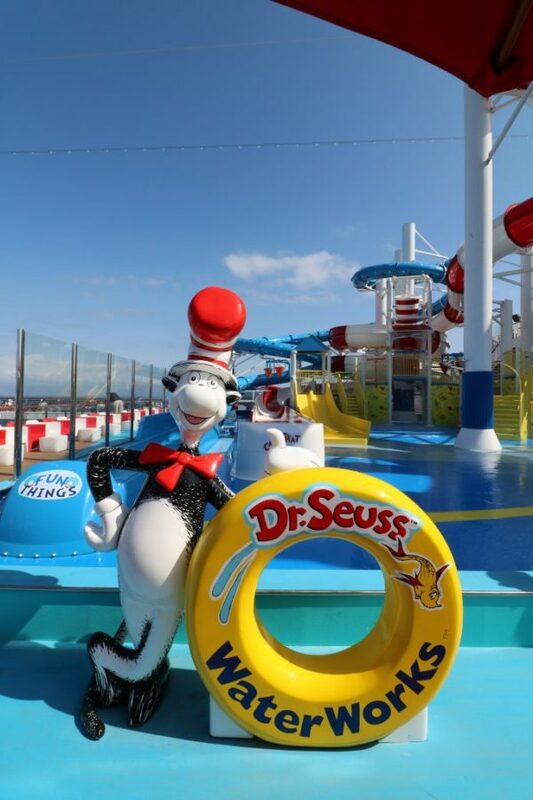 As Victory becomes Radiance, she receives the fabulous Dr. Seuss waterpark and slides, and the open-air SportSquare complex with rope course that her bigger sisters Vista and Horizon already have. I have never had as much fun on a cruise ship than I had onboard Carnival Horizon in Spring 2018. Anyone in Europe who enjoys a relaxed, casual cruise (with no enforced formal nights) should give Carnival a try as well – now there is no excuse as we don’t have to fly all the way to the US just to get onboard! 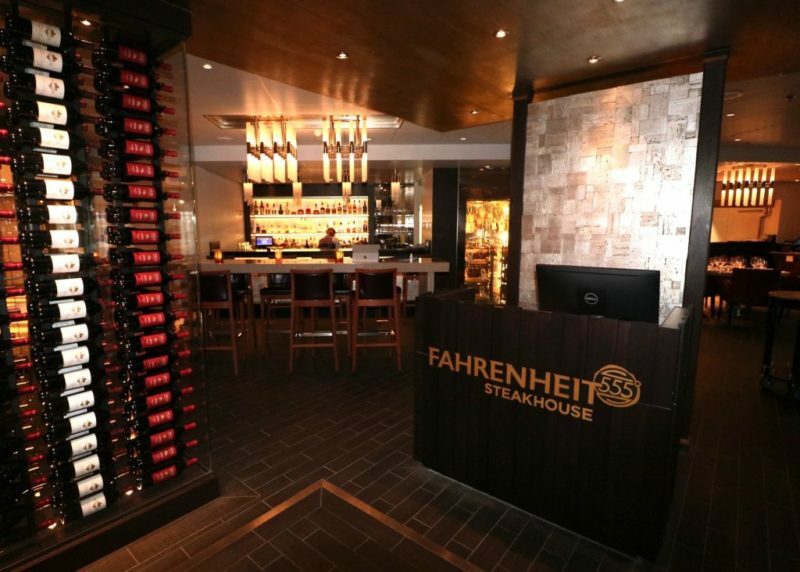 New restaurants will be added onboard Radiance during her extensive drydock. The following are found on Horizon too.. 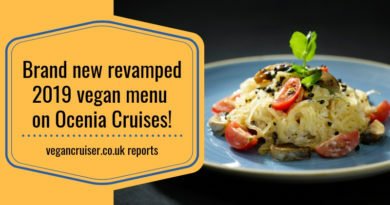 While the first two weren’t vegan-friendly to start with, and came with a cover charge, the Italian restaurant was able to accommodate my dietary needs no problem – and it was free to dine in at lunchtime. 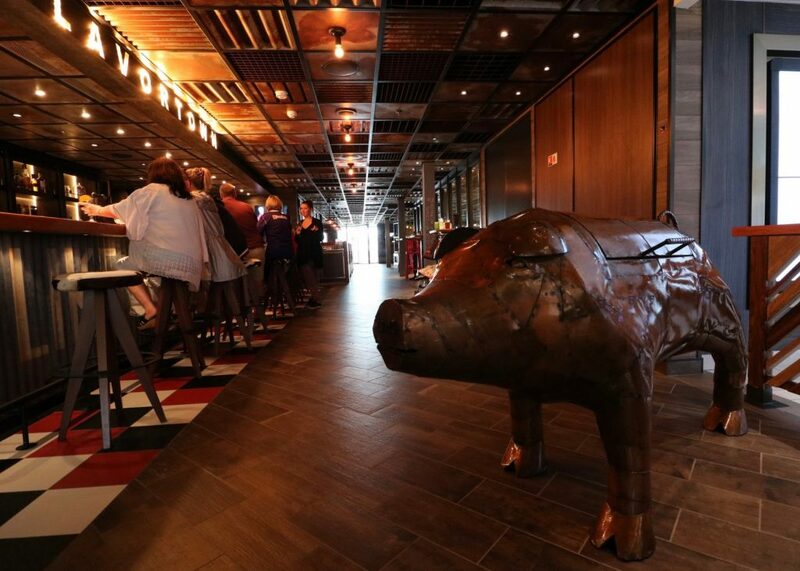 Another Carnival favourite, the Caribbean-inspired RedFrog Pub will also be onboard. Carnival Radiance will also feature a Carnival-first: Big Chicken, a seagoing version of a landside restaurant operated by the Carnival’s Chief Fun Officer, NBA Hall of Famer Shaquille O’Neal. 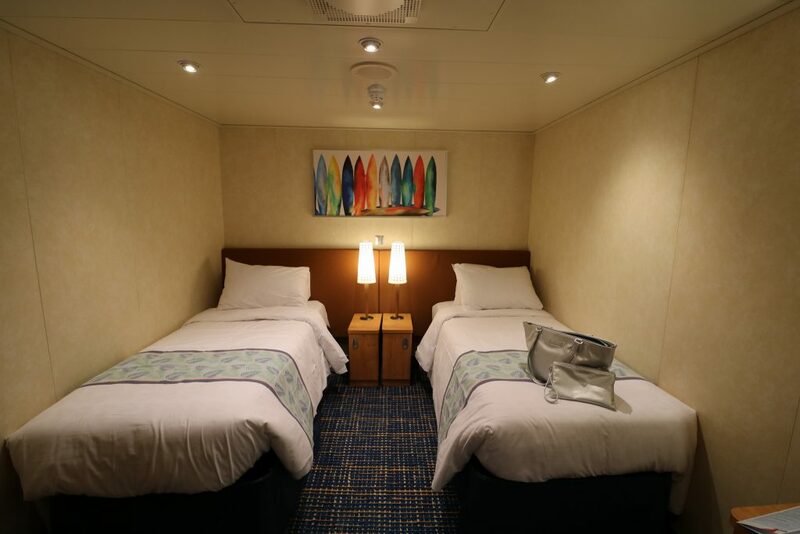 More importantly for the comfort, good sleep and for all that relaxing that takes place on a holiday it must be added that all the staterooms onboard will be renovated as well. I’m already dreaming of the Carnival Comfort bed as I loved mine on the Horizon. I haven’t slept as well, or had as comfortable bed on any other cruise ship. Even the Princess luxury bed I had later this year did not match Carnival’s Comfort offering! Our interior twin bed cabin might not look luxurious but our sleep sure was! After her transformation, Carnival Radiance will sail the Mediterranean with a selection of 9-12 day itineraries from Barcelona. She will cover both Western and Eastern Mediterranean ports – some of which are the same that her sistersVista (2016) and Horizon (2018) visited when they spent some time on the Mediterranean. Key ports like Rome, Florence, Corfu, Dubrovnik etc. 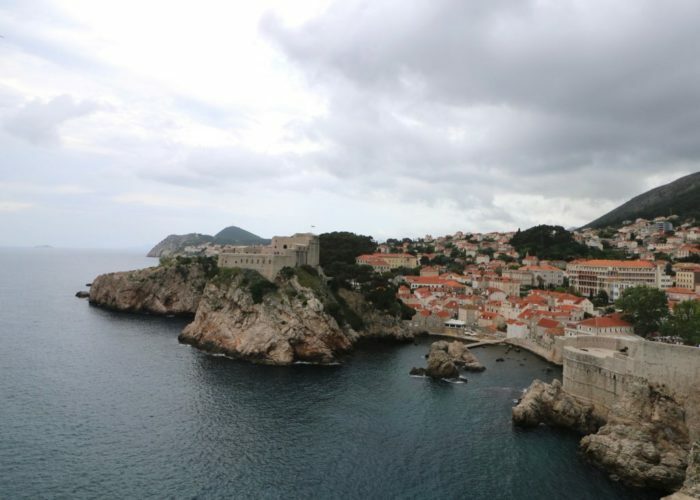 Radiance’s 2020 ports also include new destinations of Malta and the stunning Kotor in Montenegro. before a 13 night-transatlantic crossing to New York (June 11th-24th, 2020). I cannot wait to get onboard for one of these Mediterranean sailings. Who’s booking the Radiance with me? This looks amazing! 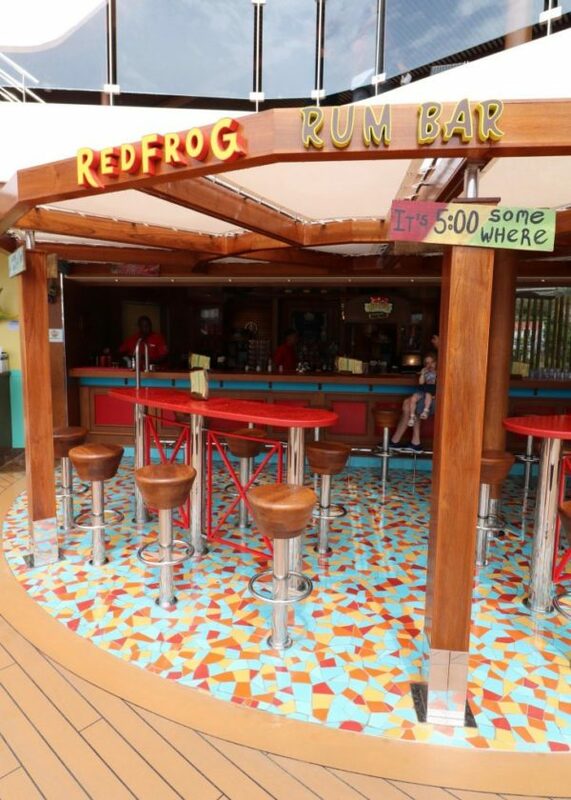 I love the look of the Redfrog Rum Bar! Also the rooms are so gorgeous! How beautiful. I would happily live on that cruise, they have such cosy bedrooms! I didn’t realize that Carnival wasn’t a force in Europe! 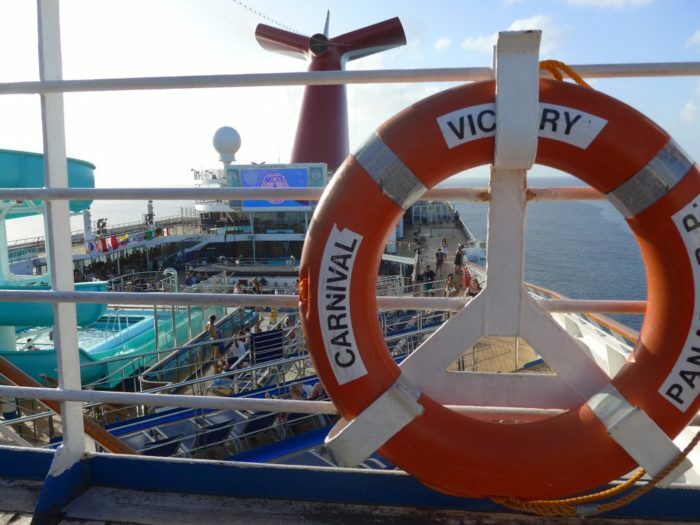 I have been on countless Carnival cruises and agree that they are “the fun ships”. The refurbishment looks amazing and this will make for wonderful voyages! Looks awesome! Seems like a great place for families.